The Bald Eagle is not only one of the most beautiful birds, but is also a well recognized American symbol. 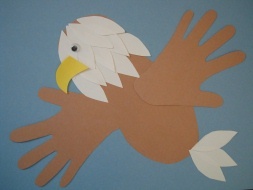 This would make a great preschool or kindergarten craft for American holidays! 1. First you will need cut trace and cut out all the shapes. You will need a brown foot and hand prints, white feathers, and a yellow beak. 2. Glue your foot print body onto a piece of blue paper. Next, glue the hand print wings on either side of the body so it looks like the Eagle is flying(as shown in the picture). 3. Glue your white feathers on the Eagles head and neck, and don't forget to put a few on his tail! Once that is done it's time to put on your yellow beak and eyes. If you don't have any google eyes you can always just draw on an eye with a black marker. You don't have to make a flying Eagle, you may choose to do a standing up Eagle like the one in the picture.